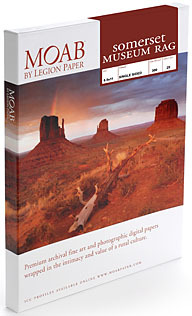 Somerset Museum Rag is the newest paper by the acclaimed St Cuthberts Mill in England, who over a decade ago helped create an entire industry when it launched Somerset Enhanced Velvet - one of the first papers used for fine art digital imaging. Somerset Museum Rag is a pioneer in its own right while remaining true to its history. 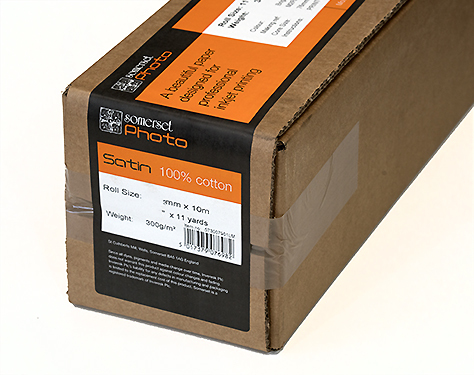 It combines an archival 100% cotton heavyweight paper with a smooth surface, sensuous to the touch while durable to everyday handling, with the latest in coating technologies to produce deep, rich blacks with an unparalleled color gamut to make a vibrant image pop to life. Cotton paper needs to be treated with care. We recommend using Helmar Crystal Kote Matte Varnish to protect your prints from the elements or mishaps and Rising Museum Board for framing and display. Approved by Fine Art Trade Guild.